Last Saturday, two eights from Belmont Hill School scrimmaged Exeter at home on the Squamscott River. Belmont Hill School, located just outside Boston in Belmont, MA, produces some of the fastest junior fours in the country, having won five straight N.E.I.R.A. Championship titles (2003-2007) and three Youth National Championship titles (2003, 2006, 2007) in the last five years. 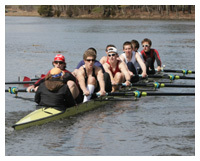 In the past few years, Exeter crews have scrimmaged Belmont Hill on the last day of the spring training week in March. However, due to scheduling conflicts, the crews were unable to race on the Charles this year. Both boys varsity boats as well as boys JV, girls varsity and girls JV are preparing for their first races of the season on April 19th against Andover, St. John’s, NMH and a few other schools. Races will take place in the afternoon at Lake Quinsigamond in Worcester, MA. Stay tuned for updates as this date nears.